The Drosophila wing somatic mutation and recombination test (SMART; also known as the wing spot test) provides a rapid means to assess the potential of a chemical to induce loss of heterozygosity (LOH) resulting from gene mutation, chromosomal rearrangement, chromosome breakage, or chromosome loss. This bioassay makes use of the wing-cell recessive markers multiple wing hairs (mwh, 3-0.3) and flare (flr3, 3-38.8) in transheterozygous mwh +/+ flr3 animals. When a genetic alteration is induced in a mitotically dividing cell of a developing wing disc, it may give rise to a clone(s) of mwh and/or flr3 cells (i.e., a "spot") visible on the wing surface of the adult fly. The total number of clones induced in a group of chemically treated flies gives quantitative data concerning the whole genotoxic activity of a compound, whereas the types of clone can reveal the mutational mechanisms involved in clone production. Variations on the SMART system described in this chapter have been used to measure frequencies of spontaneous LOH in mutants defective in meiotic recombination and disjunction, DNA repair, and cell proliferation (1-3). mutant cells); this is because small spots are produced during the last one to two rounds of cell division in the pupa, whereas large spots are produced earlier, during larval feeding. There is also another reason to evaluate small spots separately: Genetic deficiencies resulting from chromosomal aberrations most often result in only small clones, regardless of the time of initiation, as the affected cells appear to proliferate slowly if at all (4). Almost 300 chemicals have been evaluated in the wing spot test (documented in approx100 publications; reviewed in ref. 5). These include various antineoplastic drugs, small alkylating agents, bulky adduct-forming compounds, crosslinking agents, clastogenic intercalating and noninter-calating topoisomerase inhibitors, antimetabolites that disturb nucleotide pools, DNA synthesis inhibitors, and nucleoside analogs. The genotoxic effects of these representative compounds are, in general, strong and dose related (5). Aneuploidogenic compounds tested in the SMART have typically shown weak effects. This was the case for the microtubule antagonists chloral hydrate (6) and vincristine (7), which induce significant increases only in the frequencies of small single spots. Such a weak response of the SMART to detect somatic monosomy was also found for vinblastine (4,7) and vinorelbine (8), although significant increases in the frequencies of large single clones were observed for both compounds (4,8). Monosomic cells, if they remain viable, would have greatly reduced reproductive rates and so be expected to yield small single spots (4,9). For spindle poisons such as docetaxel, which disrupt microtubule assembly, a significant increase in small single spots has been observed. Consequently, this enhancement could be taken as evidence that docetaxel induces monosomic cells resulting from its interaction with microtubules, which is a behavior expected for a compound that has microtubule-stabilizing activity and is a potent inhibitor of cell division. Application of the SMART to deriving qualitative or quantitative structure-activity relationships has been achieved for several groups of chemicals: Antiparasitic nitrofurans (10), tricyclic antidepressants (11,12), pyrolysis products (13,14), pyrrolizidine alkaloids and nitrosamines (15-17), antineoplasic drugs (18-20), and polycyclic aromatic hydrocarbons (21). In this context, the wing SMART has proved to be sufficiently sensitive to be able to establish relationships between chemical structure and differential recombinational or mutagenic responses. The wing spot test is also well suited for testing complex mixtures, such as airborne aerosol extracts (22), plant extracts (23), beverages such as coffee (24,25), herbal teas and wines (26,27), as well as tannic acid (28). Although both caffeine and tannic acid were determined to be genotoxic in the wing SMART (24,26), they also both showed antigenotoxic activity in combination with several known strong mutagens (25,28,29). Thus, the SMART can also be used to assess the effects of nongenotoxic chemicals, which may act as modulators when combined with genotoxins. Such approaches identified the protective effects of chlorophyllin (30,31), ascorbic acid (32), novo-biocin (33), antipyretic analgesics (34), sodium thiosulfate (35), epigallocatechin (36) and tannic acid (28). In the latter case, however, treatment conditions appear to be critical, because tannic acid was able to enhance the genotoxicity of both nitrogen mustard (HN2) and methyl methanesulfonate (MMS) when applied as a posttreatment (28). In a similar vein, vanillin (VA) has been shown to have opposite effects on different genotoxic expressions of mitomycin C (MMC). VA significantly enhanced the recombinagenicity of MMC (to approx 170%) while reducing its mutagenicity (to approx 80%) (37). In view of these antagonistic effects, the clear overall effect of VA was to increase considerably the level of mitotic recombination induced by MMC (37). All in all, the applicability of the SMART to studies of antigenotoxic effects is reinforced by the demonstration that some modulators that decrease the incidence of mutational effects are equally able to increase the occurrence of mitotic recombination. This means that modulating agents must be evaluated not only in terms of their action on mutagenic events (point and chromosomal mutations) but also in relation to their effects on mitotic recombination. Because the transheterozygous flies express all these genetic end points, the SMART has an additional advantage over other assays: It makes it possible to draw a more complete picture of the pharmacological behavior of modulating agents, such as described earlier for VA.
Standard strains of Drosophila can transform certain chemicals, termed "progenotoxins," into reactive metabolites. This enables an array of genotoxins requiring bioactivation to be readily detected in the wing spot test, including pyrolysis products (13,14), hydrazines (25,38), vicinal dihaloalkanes (4,39,40), heteroaromatics such as aflatoxin B1 (4,40,41), pyrrolizidine alkaloids (17,42) and nitrosamines (15). The wing spot test is also well suited as a model system to study nitrosation by sodium nitrite in vivo (43). 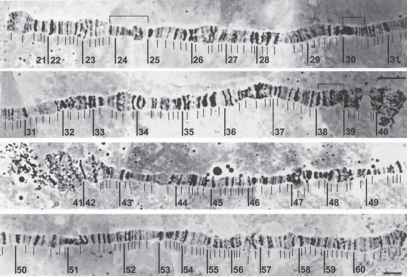 In 1989, Frölich and Würgler (44) constructed new strains with high constitutive bioactivation by introducing chromosomes 1 and 2 of a strain in which cytochrome P450 levels are increased compared to the standard tester strains. In particular, the CYP6A2 level is increased (45) primarily as a result of mutation of the cytochrome P450 regulatory gene Rst(2)DDT. The levels of other cytochrome P450 proteins may also be affected in this mutant, but this has not been demonstrated. With promutagens such as aflatoxin B1, urethane (44,46) and N-nitrosopyrrolidine (21,47), which are readily detected with standard strains, high bioactivation resulted in steeper dose-response curves. High bioactivation strains are particularly useful for testing polycyclic aromatic hydrocarbons, their nitro derivatives, and other aromatic chemicals, which require metabolic activation and frequently show a weak response with standard strains (21,48). The most striking case is that of dimethyl-4-aminoazobenzene (butter yellow), which gave positive results only with high bioactivation. Finally, the situation for environmental contaminants is not documented to the same extent as that for chemical compounds. In spite of this, several studies revealed advantages of the wing SMART as a method to evaluate the impact of possible environmental changes. The test appraised environmental contamination, including airborne particulate matter, at two different sites on two dates in Mexico City, using the ST and HB crosses. The extracts showed genotoxic activity predominantly in the HB cross, indicating the presence of indirectly acting genotoxins. A good correlation with the same extracts in the Salmonella microsome assay reinforces the suitability of the wing spot test to detect genotoxicity associated with airborne particles (21,49,50). More recently, the SMART was also applied to monitor the genetic toxicity of surface waters under the influence of urban and industrial discharges in the Caí river (Porto Alegre City, Brazil), proving its sensitivity to detect contamination from urban discharges (51,52). The broad spectrum of genetic end points monitored as LOH in somatic cells—including point mutations, deletions, unbalanced half-translocations, mitotic recombination, chromosome loss, and nondisjunction—makes the wing SMART a most versatile in vivo test. It is also technically simple, quick and inexpensive to do, and allows flexibility in the choice of both route of administration of the test chemical and time of exposure. In addition, it allows analysis of an extensive sample size, because microscopic inspection covers approx 50,000 cells per fly. Moreover, statistical procedures applicable to the SMART are well established, and different statistical tests can be applied according to the peculiarities that specific sets of data may show.